We have a fantastic voucher code for all our Mums and Dads to be this week, along with anyone that wants to buy a gift for a new baby or treat someone that is expecting. Until July 11th 2012 enter the voucher code at the bottom of this page at the checkout at Mothercare and you will save an extra 20% off all qualifying products when you spend over £100. This discount code does not work with the usual exceptions including baby milk, Bugaboo and TP Toys, but apart from that everything on the site is included which means you can make some fantastic savings, whether you are looking to buy maternity clothes, want to decorate the nursery or need to get a pushchair. The discount is fantastic but you have to checkout before Wednesday 11th July to make sure you qualify. As the summer is on it’s way, what better way to look cool and feel great during your pregnancy than with the beautiful range of summer maternity tops from Mothercare which all qualify for this offer – even those that are already reduced. 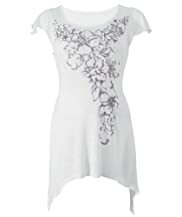 Take a look at this gorgeous Maternity Vintage Floral Print Cami Top from the M2b range at Mothercare. Now only £12 but still qualifying for our 20% discount code, which makes it less than £10 if you use our offer. This 100% breathable Cotton top is perfect for keeping cool and looking great this season. It has delicate spaghetti straps and a beautiful pink and white floral pattern that is light and fresh and ideal for these long hot summer days. 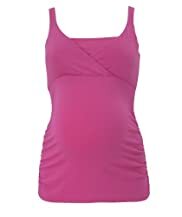 Completed by under the bump gathering and an adjustable drawstring so that this top continues to fit throughout your pregnancy and beyond, you can flatter your growing body and still keep cool and relaxed. Coordinate with jeans, cut off trousers or even maternity shorts and you have the perfect summer outfit to keep you looking fresh and feeling great. And when you think this top is less than £10 when you include it in this latest promotion, you will find that you can save throughout the store, stocking up on all your summer essentials and still enjoying massive reductions. If you have nieces, nephews, friends or older siblings that you are shopping for this Christmas, take advantage of the Mothercare offer today where you can claim 20% off all toys. This includes their full range of Mothercare toys as well as the complete range of ELC toys on their site. There are no voucher codes for this offer, you simply click on the Mothercare banner to start shopping and the 20% will be taken off automatically at the checkout. And with FREE DELIVERY on all orders over £50 why not make the most of this offer and get all your Christmas Shopping done in one go. Though Mothercare are synonymous with selling high quality baby toys, the range on the website includes toys for all ages including fantastic older children’s toys including Twister, Lego Dune Hopper and even the TP Trampoline. So take a look at Mothercare today and get some fabulous Christmas presents all with 20% off today. If you have been missing the fabulous range of Blooming Marvellous Maternity Clothes since the brand was taken over by Mothercare, then your wait for stylish, comfortable maternity wear is over as Mothercare introduce a whole host of Blooming Marvellous styles back into the Mothercare online store, and with designs and styles that look better than ever. We love this Blooming Marvellous Black Maternity Asymmetric Hem Jumper.Made with 5% cashmere for a gorgeously soft luxurious finish, this jumper is incredibly flattering and can be worn with almost anything. Looking fantastic with maternity jeans or maternity leggings, this jumper is so sophisticated that you could wear it for a casual lunch out or for a smart evening dinner. The asymmetric line of this jumper not only provides something a little bit extra in the design, but as the eye is drawn down to the point of interest, it skims over your bump giving a flowing, slimming silhouette. But the most amazing element to this jumper is the level of comfort. 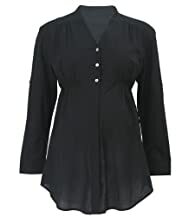 It feels fantastic to wear and when you are pregnant and hating the feel of a lot of itchy, scratchy jumpers, it is a relief to find something soft and comfortable to wear that you can relax without overheating. And right now, Mothercare are offering 10% off everything you buy online, when you spend over Â£100. This offer is not to be used in conjunction with any other offer and the usual exemptions apply, but you will find that you can make savings across the store. So why not use this opportunity to get ready for your new baby and to treat yourself at the same time. With such a fabulous range of nursery equipment you can easily get everything you need for your baby and save enough money to not only treat yourself to this beautiful maternity jumper, but a whole host of gorgeous items for your wardrobe. To claim your discount simply click on the Mothercare banner at the bottom on this page and start shopping. When you have finished simply go to the checkout and cut and paste the voucher code from the bottom of this page. 10% will then be discounted off all eligible products and you get the products you really want. So start shopping at Mothercare today. This voucher code is only valid until Friday 4th November 2011 but could end sooner if demand is to high. So place your order today and take advantage of another incredible saving at Mothercare. It may seem strange that anyone would offer you a voucher code for 10% off when you spend over Â£120, but when you see the full range of products at Mothercare for those that are expecting, it is easy to see how you can quickly reach this value in your shopping basket which makes it possible to make huge savings with our Mothercare discount code this weekend. Whether you want to kit out your nursery, buy your new pushchair or just get some great new maternity clothes, everything on the Mothercare site is included in this fantastic offer with just the usual exceptions (products already reduced in the Offers section, Gift Vouchers, Milk, Medicines, Bugaboo, TP, Plum, Axi, Selwood, Saber, Mix & Match Nursery). So if you are looking to buy something from Mothercare this weekend and want to save 10%, simply click on the Mothercare banner on this post and use the voucher code below to save 10% on every qualifying item when you spend over Â£120. You have to check out before midnight tomorrow, Sunday 18th September 2011, but as long as you do, you can make some terrific savings. With the kids back at school and days and the usual routine coming back in to play, a number of pre-natal aqua aerobic classes start again this week giving us all the opportunity to get fit during our pregnancy and meet some like minded mothers that will probably become friends for a very long time. Aqua aerobics is ideal for pregnancy as it combines aerobic exercise with the support and comfort you need during pregnancy to keep you and your baby safe when you exercise. In every class you can push yourself as hard as you like or take it easy for a gentle warm up that is going to make you feel great during your pregnancy, and Mothercare have maternity swimwear that is ideal for all aquatic activity whether you are looking to have a full body workout or just take some time to be weightless and free as you get bigger during your pregnancy. We love the Leaf Print Tankini that is available in the Mothercare online store right now. With its bright leaf pattern and block colour shorts, this brings the fun back into maternity swimwear and would look equally great on the beach or in the pool. The halter neckline ensures you get the support you need for your bust during pregnancy but the elasticated costume and maternity design mean that this costume will grow with you during pregnancy. Thanks to the long cut, the costume will continue to expand as your develop and will ensure you remain covered and fully confident down to the day you give birth. There are a great range of maternity clothes at Mothercare right now that are going to suit you no matter what you are looking for this season. So click on the Mothercare banner at the side of this page and go directly to the site that is going to have everything you need with 10% discount when you use our voucher code before midnight tomorrow. And remember to keep coming back to Simply Maternity for more ideas and special offers on everything you need for your pregnancy. Until 11th August 2011, we here at Simply Maternity are able to offer all of our customers an outstanding offer at Mothercare – 15% off the full range of products only excluding Gift Vouchers, Milk, Medicines, Bugaboo, TP, Plum, Axi, Selwood, Saber, 3 for 2 Items, Mix & Match Nursery Offer and ELC Toys. Though this offer cannot be used in conjunction with any other offer, this voucher code can be used in every department in the store, which means that if you are preparing your nursery, getting ready for a new baby or simply need some maternity clothes to keep you looking great before the birth, then now is the chance to buy at one of the best maternity and baby shops in Europe at a fantastic discount. Included in this offer are a great range of Maternity Dresses that are perfect as we come into the Autumn season. We love this short sleeve jersey dress. A simple yet flattering design, this dress is available either in this gorgeous deep blue or standard black and is ideal for workwear, evening wear or a comfortable stylish outfit for the day. Team with high heels and jewellery or ballet shoes and a comfy cardigan, or even simply put on a pair of court shoes and go for a a great range of styles and looks that are going to make this a versatile, comfortable dress that you are not going to want to be without. Normally only Â£25, this dress is part of this fantastic offer where you can claim 15% off everything you buy at Mothercare. To claim your discount simply click on the Mothercare banner at the bottom of this page and enter voucher code ‘S4PN‘ at the checkout and your discount will be automatically deducted. Whether you are looking for maternity clothes or for items in any department within the Mothercare store, place your order by midnight on Thursday 11th August and your discount will be applied. When we think of maternity essentials and baby products, the first name that comes to most of our lips is Mothercare. Known for their incredible range of products to provide everything you need for your pregnancy, birth and new baby, Mothercare are a retailer that most of use some time during our lives. And if you don’t have any children of your own, Mothercare is also an ideal place to get presents for new born babies or subsequent birthdays. The offer covers practically everything on the site, though you can’t use it with any other offer, but you can buy all your maternity clothes and stock up for your new baby in one shop and get some amazing discounts. Imagine buying all your maternity clothes with this offer, the savings you will make could even buy a new pushchair. We love this knitted wrap maternity jumper from Mothercare. In a lovely soft cotton based knit that is going to keep you comfortable all day long, this gorgeous jumper has an empire line that is going to grow with you as your tummy grows but has the length to ensure a perfect fit. The cross over neckline and reverse ribbon tie means that this jumper will keep its shape and provide you with definition throughout your pregnancy, enabling you to look and feel great whatever the weather outside is doing. The delicate design to this maternity jumper means that you can use it for work or for a casual event with maternity trousers or a long skirt, or you can jazz it up with accessories and more formal trousers or skirt for a fantastic evening out. This jumper is ideal when you know you are going to be feeling a bit chilly but you want your soft and sensual side to come out. A fantastic design from Mothercare which also qualifies for their amazing new offer. So click on the Mothercare banner below to go directly to the Mothercare site and start shopping now. We don’t yet know how long this offer is going to last so take advantage of it now while you can. We have a great range of maternity knitwear on our site from Mothercare and a whole team of top maternity retailers just for you. So take a look around our site and find the maternity clothes that are going to make you feel special during your pregnancy. This week sees some great offers on Maternity Clothes at Mothercare with 3 for 2 on Maternity Fashion and Essentials and Two Pairs of Maternity Jeans for Â£60. The range of Maternity Jeans at Mothercare is fantastic. 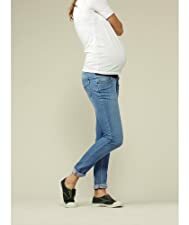 All Mothercare maternity jeans are designed with an ‘under the bump’ waistline so that your jeans fit snuggly underneath your growing bump so that you don’t have to worry about your jeans cutting into you or overheating as we come into the warmer months. Available in skinny, boyfriend or boot cut styles and up to date with the latest trends in terms of wash and fit, the Mothercare jeans are designed for comfort but in no way compromise on style. The more casual boyfriend cut gives a relaxed baggier fit, while the Skinny jeans provide a more dressed up look and are ideal teamed with a flouncy top for a night out. The classic Boot cut jeans are designed in soft stretchy denim so that you don’t have to compromise on your own comfort to look good. And if you can’t decide which style of maternity jeans to buy, then there is no better time to buy two. Right now, Mothercare are offering two pairs of jeans for just Â£60 and as you get free delivery on all orders over Â£50, it won’t even cost you to have them sent directly to your door. There is no voucher code, simply click here to go directly to the Mothercare site and place your order, your discount will be automatically applied at the checkout. To finish your outfit, why not team your jeans with a long shirt and some sparkly jewelly for a cool, casual evening look. For a fresh day time look, opt for a floral printed t-shirt or relaxed cross over top, which will give you all the freedom you need and keep you relaxed and happy all day long. Or why not just get all of them, as right now all these tops are in the 3 for 2 offer, which means you can get all three tops for the price of two or choose something else in the range completely free! So why not go a bit mad and take advantage of these fantastic offers at Mothercare. They won’t be around forever and stock is going to run out fast. So click here to go directly to the Mothercare site or check out our full range of Maternity Clothes on our site from all your favourite Maternity Retailers. And keep coming back to Simply Maternity for more offers and discounts on all your maternity wear. At Mothercare this week, you can save up to 50% in their sale. 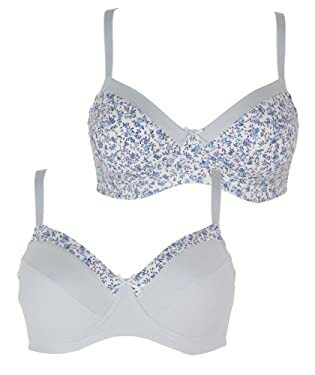 But Simply Maternity have discovered that a lot of the discounts at Mothercare are far more than 50% including some great items in the Maternity Lingerie department such as these fabulous Floral Print Maternity Bras. This two pack of of bras are great because they are not only supersoft and incredibly comfortable but are also beautiful. Originally Â£24, this two set is now only Â£9.60 – that’s less than Â£5 per bra! So check out our full range of Maternity Lingerie on our site and see the full range of sale itemsÂ at Mothercare – there are some fabulous discounts to be found. Here at Simply Maternity, we were told direct from the merchants about the recent news that the Blooming Marvellous brand and trademark has been acquired by Mothercare plc, who will be relaunching the brand next year. Blooming Marvellous had a great brand and had some of the finest Maternity and Baby products with several stores in the country. We worked with the team at Blooming and they were a great team. Its a shame to hear the news but I’m sure Mothercare will do a great job in bringing there brand into the stores so that us Mummies can still have some of the finest maternity clothes both online and in-stores.